Significant amendments to a number of tax-regulatory acts are enacted from 1 January 2018 including VAT. The amendments envisage a lower threshold for mandatory registration in the Register of VAT Payers and extend the business areas eligible to special VAT payment regime, the so-called reverse VAT. Starting from 1 January 2018, registration of tax payers in the State Revenue Service as VAT payer shall not be mandatory unless the aggregate value of the supplied VAT-taxable goods and services provided by them during the previous 12 months exceeds EUR 40 000 . If, however, the amount of EUR 40 000 is exceeded during the previous 12 months, mandatory registration shall apply to private individuals as well as to merchants. It shall reduce the risk of fictitious businesses registered in the Register of VAT payers – namely, companies without intention to pursue actual commercial activities and intended for VAT fraud schemes in future. Starting from 1 January 2018, certain other industries shall apply the reverse VAT payment procedure, in particular: supply of construction products (earlier applicable only to construction services), supply of metal articles and the related services; supply of household electronic appliances and household electric hardware as well as X-boxes. It means that, contrary to the overall VAT payment procedure, the VAT for supply of goods or provided services shall be paid into the State budget by recipient of the goods or services who is a registered VAT payer. The reverse VAT payment procedure is among the most effective quick response tools in combating major, sudden Vat fraud. 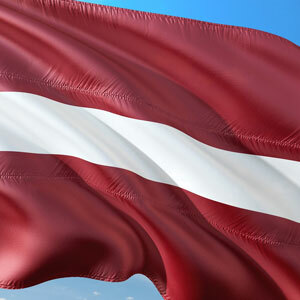 In Latvia, it was earlier applicable to timber industry (supplies of timber articles and various services provided in relation to timber supply), supply of metal scrap and related services, construction services, supplies of certain electronic devices, and crop industry. The implementation of such payment procedure shall improve the conditions of fair competition, limit the actions taken by tax payers in bad faith, and enable the Tax Administration to focus on VAT collection at the stage of ultimate consumption. Amendments to the VAT law stipulate that, starting from 1 January 2018, a domestic VAT payer shall apply the reduced rate of 5 percent to supplies of food products including fresh fruits, berries and vegetables, including washed, peeled, shelled, cut and packed without thermic or other processing, such as frozen, salted or dried, listed in the Annex to the Law. The amendments have been developed pursuant to Article 98 of the Council Directive 2006/112/EC of 28 November 2006 on the Common System of Value-Added Tax. Article 98, Para 1 of the said Directive stipulates that Member States may apply either one or two reduced tax rates. The above-mentioned amendments shall not apply to supplies of fruits, vegetables and berries that are thermally or otherwise processed (for example, sauerkraut, salted cucumbers, pickled tomatoes, etc.) to which the standard VAT rate of 21 percent shall apply.